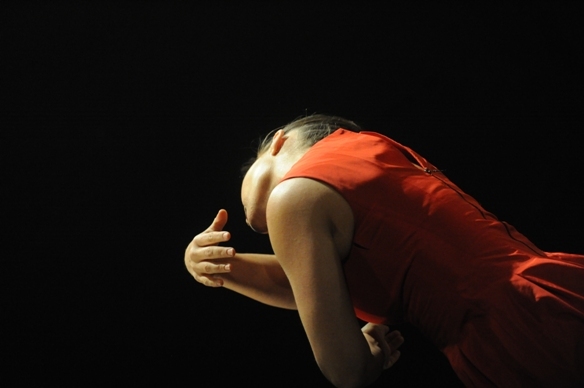 Passionate and precise, the choreography of Ronit Ziv is known for its striking images, conceptual depth and playful humor. Marathon 40 culls together four short pieces from Ziv’s repertoire, with a twist: each program hosts the work of a guest artist. Now, for the first time, instead of a choreographer, Marathon 40 will host the classical singer Bracha Kol, who will perform John Cage’s Aria. Celebrating 25 years to the Suzanne Dellal Centre, the performance in Yaron Yerushalmi Hall has a unique significance for Ronit Ziv. Rose is Not Waiting, the evening’s opening piece, was first performed in this hall in 1999, where it won first place in the Gvanim BeMahol (Shades of Dance) Competition, a rite of passage for Israeli choreographers. Performing will be Nofar Poni and Shira Ben Uriel, who began working on the piece in the dancer’s training program at Bikurei HaItim. The two young dancers convey a depth of expression in this demanding work that pivots on the hinge between solitude and loneliness, embodying the conflict between the desire to connect, to be close, and the urge to raise one’s defenses and keep intruders out. Catch your breath, the next piece, Matkot (an excerpt from the full length dance piece Tide) takes one to the beach and the ubiquitous Israeli paddle game – matkot. The matkot are put to imaginative use in this playful and provocative duet. Performed by Sofia Krantz and Gefen Liberman, the lithe and limber, smiles and schoolyard style hand-clapping games suddenly turn into a struggle: these bathing beauties play a dangerous game. The duet between Ronit Ziv and Bracha Kol is more harmonious, their artistic dialogue runs deep, conversing and consulting with one another for several years. Bracha Kol was the music consultant for Matkot, selecting compositions that have an association or connection to the sea, such as Claude Debussy’s La Mer. One of the works featured in the soundtrack is Luciano Berio’s Recital for Cathy, a work he composed for Cathy Berberian, the singer to whom John Cage dedicated Aria (1958), the next work on the evening’s program. Opera devotees may be surprised to find mezzo soprano Bracha Kol performing John Cage’s piece, yet the talented singer’s repertoire has always been very diverse, ranging from early music to contemporary compositions. 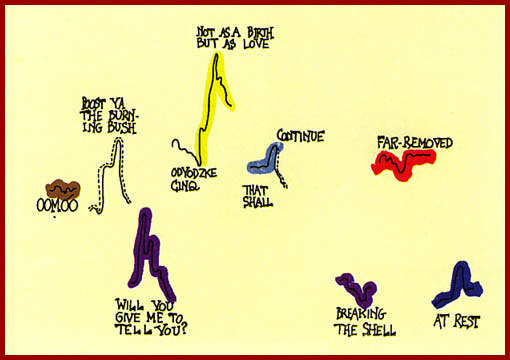 Each of the ten colors represents a different quality of voice in terms of pitch and timbre, lines indicate the length of the sound, and there is also text in five languages: English, French, Italian, Russian and Armenian (a tribute to Cathy Berberian, whose cultural heritage is Armenian). The black squares represent some kind of additional sound to be produced, either by the performer, an instrument or another object. Following Aria, the next piece is a solo performed by Ronit Ziv: French for Beginners. The evening’s closing piece is Cassandra, performed by Sofia Krantz and Gefen Liberman. It’s a powerful work, depicting the final hours of the Trojan princess. The mythological Cassandra was given the power of prophecy by Apollo, yet fated never to be believed; she predicted the downfall of Troy yet was unable to prevent or stop the cycle of tragedy. Ziv’s interpretation is not a narrative or theatrical work, she does not tell the story of Cassandra, but rather conveys the essence of the mythological heroine. Dancing to Brahms, Piano Concerto n.1 op.15, their torsos are bare, their breasts bound by black tape – an image of Cassandra before her death, held captive in Greece: the conquerors may take her life, but not her spirit. Suzanne Dellal, Yerushalmi Hall, Friday May 9 at 14:00. Tickets are available online.